(AP Photo/Kamran Jebreili) Pope Francis blesses worshippers during a Mass at the Sheikh Zayed Sports City in Abu Dhabi, United Arab Emirates, Tuesday, Feb. 5, 2019. Abu Dhabi, United Arab Emirates • The soft hymns of “Hallelujah” boomed from speakers Tuesday as Pope Francis celebrated the first papal Mass in the Arabian Peninsula for about 180,000 people, capping a visit to the United Arab Emirates that emphasized the presence of minority Christians in the region and a greater understanding with Islam. 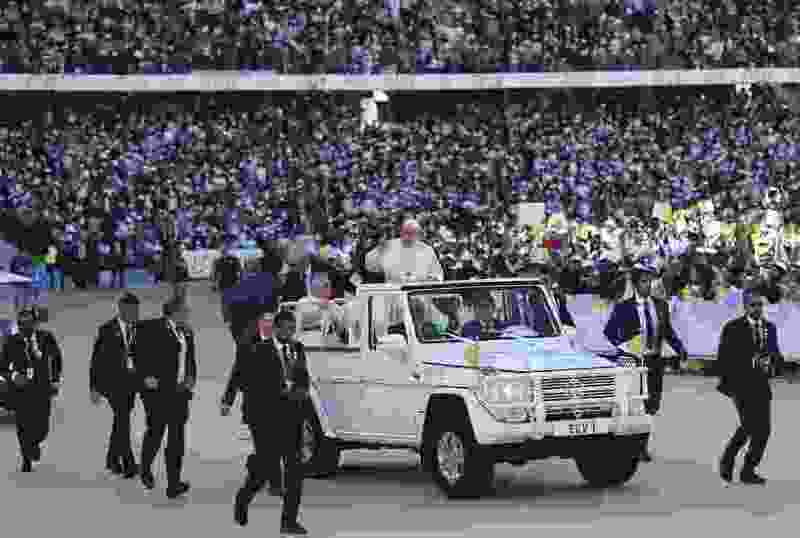 Cheers erupted inside and outside the stadium when Francis arrived and looped through the crowd in his open-sided popemobile, with chants of “Viva il Papa” and “We love you!” Yellow and white Vatican flags decorated the stadium, and smaller versions were handed out to worshippers inside. In comments to reporters on his flight back to Rome, Francis said he sensed “goodwill to bring about a process of peace” in Yemen during his meetings with officials from the UAE, Saudi Arabia’s key ally in the war. Francis’ trip came 800 years after his peace-loving namesake, St. Francis of Assisi, visited an Egyptian sultan and marked the culmination of years of Holy See efforts to improve relations with the Muslim world after they hit a low during the papacy of Pope Benedict XVI.